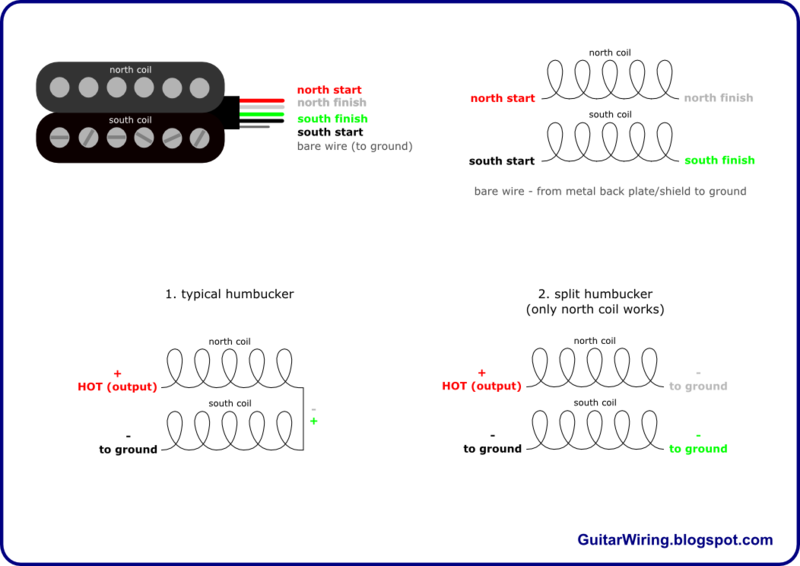 I made a diagram, which shows how 4-conductor guitar pickups (humbuckers) are configured. It can help you understand how many kinds of guitar p-up wiring (like coil-split, series, parallel) works. As you can see, a humbucker is a guitar pickup made from two coils. It's basically like two single-coil p-ups on one plate, in series, out of phase, where one has got reverse polarity (north/south). Sometimes they're sharing one magnet bar, sometimes they have independent magnets. All fun with guitar pickup wires is based on changing their relations. 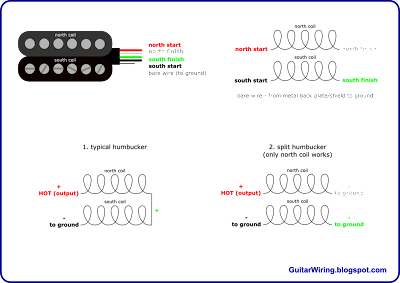 The examples on the diagram shows two basic, popular ways of wiring 4-conductor humbuckers. The first example shows the typical HB wiring. The second shows split coil system. As you can see, the split humbucker configuration is based on one working coil, which has the hot wire. The second one is connected to the ground by its both wires. This coil is not working like a pickup, it's a part of the guitar wiring ground here. This is how a humbucker can work like a single-coil guitar p-up. Coils for HB are usually different than coils for classic SC's. This is why you will probably not get the true Strat guitar tone with a split humb. It not means that you will get a worst tone. It means, that I'm writing about two, a little bit different types of tone. BTW, you should check out your humbucker wire color code, before you'll start making a guitar wiring. You can find it on manufacturer's website, or here.